Ramnagar Forest Department has released a notification for the recruitment of Forest Guard on the basis of Direct & Daily wages. Interested candidates can apply for the job of Forest Guard in Forest Dept Ramnagar (Nainital) before 31 August 2015. For Daily Wages : Candidate must have passed Class 10 from a recognised board and working in Uttarakhand Forest Department. For Direct : Candidate must have passed Class 10 from a recognised board and should have domice & registration employment office in Uttarakhand. Candidates will be selected on the basis of Physical test and written exam. For Daily Wages : Hindi writing (Essay) and General science (Quantitative question). For Direct : Hindi Essay and Mathematics (Quantitative question). Applicants should be sent their fully filled application form by registered / speed posts along with essential certificate and two self attested envelope of size 22 cm X 10 cm with Rs 30/- stamp on each to Uttarakhand Forest Department office before 31 August 2015. 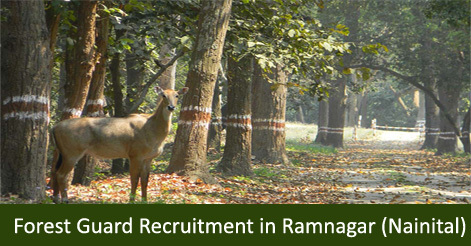 Help us to improve this article/job posting "Forest Guard Recruitment in Ramnagar Forest Department". We would be glad if you can comment below and provide your valuable suggestions and feedback. If this page have any wrong information/list or out of context content, then you can report us as well. hello sir,my name is kalyan Dhali.i lived in haldwani in uttrakhand. i want to know what is the average salary of this job given by goverment. कब से शुरू हो रही है..
plz sir tell me date of filling the forms of forest guard .